I devised this model after long deliberation one night back in 1994 in a Cape Town restaurant. The way phrases like “Relationship Marketing” and “Database Marketing and Relationship Management” were explained was just too complicated, unstructured and illogical. As a result I was looking for something simple, logical, comprehensive, universally applicable and safe from fashion or buzzword attacks. I also wanted to show the interconnectedness between “encompassing elements” that represent the entire organisation – irrespective of size and complexity – rather than individual disciplines or departments. At the top you will find the Support element. It represents (top) management and its role to guide and assist in strategic matters, their understanding of themselves, the business and society. It is not confined to just the top management, but also includes lower management levels. Skills is about the internal energy, the people energy of the organisation, their fitness, personal, cultural, technical, spiritual, social and product skills. This can only grow and be nurtured with adequate “Support” support – pardon the expression. Systems is about “technology”. It is about internal information systems, analytical tools, external contact points, computer telephony integration, instant communications, call centres, help desks, campaign and relationship management tools, data warehouses, intranets, extranets — literally anything related to gathering, storing, analysing, sharing and applying administrational, customer and market information and “intelligence”. Serviceis about what a company does to and for the customer. This includes non-product specific information or actions aimed at nurturing the relationship rather than selling more at all cost. It’s also what makes the “impression” with the customer, be it pre- or after-sales support, how the company portrays itself in public, etc. Traditionally you’d probably call this “Marketing”. Structure is about internal issues like training, remuneration, role responsibilities, in short: those things that need to be addressed in order to support the efforts made in the other elements, because there is no point in establishing a call center if you experience massive a staff turnover. The origins for problems in this area are usually found and addressed within this element. The Sales at the bottom is what drives any business. At the end of the day, even in a relationship-based customer management structure, the end result is either more sales to existing customers or a vastly improved business efficiency that does not compromise targeted and relevant customer communications. Last but not least, there is the Self element, and that is right in the middle, where all the other elements meet, because after all, business is about people, and (e-)commerce is about satisfying the needs of people, personally or professionally. The Self is also the one element that ties all the other ones together. Remember that this method emphasises the “soft” elements in an organisation and doesn’t provide immediate “quick fixes” or strategy changes. Yet in each of the elements are hard factors, the so-called “key performance indicators” (KPI), the things you can measure and compare over time. Measure the investments in IT against increases in customer loyalty or a reduction in incoming support/help calls. Measure staff turnover rates against training costs/initiatives. Measure your investment in training and job development against hiring and ramp-up costs. Link customer satisfaction surveys to staff sick leave and duration of service/employment. Measure skills levels and remuneration against product or process improvement suggestions. Measure the impact of new IT investements on sales. Measure structural adjustments (role responsiblities, team formations) against improved performance (internal audit and CS surveys). Measure individual product-related offers against customers to non-product-related offer. Compare press clippings with internal staff morale. Something not that “hard” but nevertheless very telling: compare the type of books your staff reads (via Amazon) with the mission statement of your organisation. Measure your IT investment against the costs of maintaining it, incl. database administrators, BI analysts or other consultants you have to bring in to make sense of the data you’ve collected. In general, there are many many different ways of comparing different measurements, but the key is to obtain such data in the first place, even if it sounds a little “off-topic”. Customer-driven companies attract better staff and lose less existing employees. The offer relevant and fairly priced products/services, and merge internal improvement suggestions with external ones. They know the impact expenses/investments have on the various elements of the Diamond CRM framework. The framework is meant for you to identify those “sub-elements” that need addressing and … fix them. This way you rid the organisation off bottlenecks and shortcomings, in other words factors that have a negative impact on other elements in the organisation – and believe me when I say that everything eventually impacts on the success or failure of your CRM project! In short: you need to think laterally, because problems in “Skills” are likely to find their cause in “Structure”, “Systems” and “Support”. Finally, when all bottlenecks are removed and the information and “energy” flow between the elements is working in harmony, you’ll achieve something you’d call “success in CRM”. However, you’ve really only worked on the periphery, just like a good doctor looks at your entire system rather than just the symptoms. A tip: there is obviously a lot more to this framework than meets the eye. I see myself helping you make the things work for you because I know you don’t and cannot know all there is to it – it would in any case go beyond the scope and purpose of this website. However, it will give you a good idea of what you can expect from me and Emilio, should you require his skills in areas I am not familiar with. That said, below you will find a little more in-depth information about each of these elements, and a checklist / outline to get you started in a sensible and logical manner. If you then need help, please feel free to contact me, because I’d love to put the finishing touches on this deeply rewarding process. If you’d like me to be involved from Day One already, I’d be delighted to hear from you. Change is often painful, and that’s why many leave it until they are forced to. Only a few trailblazers (innovators in marketing lingo) brave the odds and enter new and often unknown territory. In order to implement a successful customer-driven business strategy, one first has to get the right “attitude” – one’s own and the organisation’s one, too. However, this can be disregarded if the change is induced voluntarily and not forced upon the organisation. In the latter case, the attitude can be changed (and most certainly will) by explaining the distinctive benefits of the processes initiated through the “Diamond CRM” framework – and there are many of them. After all, it’s a logical process and structured path that drives the process. The first step is that top management – and subsequently everybody within the organisation – develops an understanding of the “Diamond CRM” and the potential benefits for the individual and the business. In other words: why a customer-centric business model is the only way to survive, never mind thrive in a highly competitive market environment. Top management’s responsibility is to develop a strategic vision from their understanding of the subject matter, and then guide and assist all those involved. This top-down approach is complemented by a working bottom-up communication structure that ensures a steady flow of critical information to the appropriate upper levels, both in the design and implementation phase. Top management is assisted by “champions” within the departments, individuals who 1) help those underneath them with the transformation process and 2) communicate regularly with the other champions to co-ordinate their efforts. Remember: Customer Relationship Management is no longer the sole responsibility of the Marketing Department or even IT Department. Those organisations who have successfully transformed their business operation based on the “Diamond CRM” framework, have started right at the top. It is top management’s vision, their understanding, assistance and guidance that drives the concept top-down, but as a direct result creates an empowerment process that is grown and lived bottom-up. But why should top management – which is usually driven by hard financial facts – consent to and support something that has such far-reaching implications? Why should they introduce even more change to an organisation that is hardly able to cope with day-to-day life in an increasingly stressful, turbulent and decaying society? a successful implementation of the “Diamond” first and foremost contributes to a far more humane level of communication between the organisation and the customer – internal and external. This communication is based on honesty, openness, trust and respect. If all companies applied such an approach, this positive ‘aura’ would soon impact on society as a whole – resulting in a reduction of stress, uncertainty and destructive conflict, in short: a better life for all and a healthy business too! the entire marketing process becomes transparent and measurable. Methods and channels will be re-assessed and adapted; significant cost savings – by far not limited to the marketing process alone – will be a direct result of this process. individualised customer communication and management lead to a product and service intelligence base which provides market information and knowledge far deeper than any traditional research would ever reveal. Not only is the quality higher, it is also more accurate, more timeous, and far less costly. It goes without saying that information gathered on the database system will be of great benefit to other business functions too – either leading to the generation of additional revenue or to cost-savings because of an enhanced knowledge base. This also reinforces the modern view that Marketing is no longer an isolated function, but an integrated approach that affects and is affected by each ‘business function’. So, apart from the ‘moral’ benefits of applying the “Diamond” framework, the financial implications should be convincing enough; and once top management commits itself, it will trigger a series of events that will lead to a bottom-up process, where employees are given the tools and responsibilities to make the customer communication process as beneficial and profitable for both parties as possible. Depending on the size and complexity of the business, this first step can be achieved within a few hours. If doubts persist, an in-depth analysis of the company’s current marketing environment as well as case studies of successful companies will support the arguments with facts and figures to convince any open-minded executive or board. Top management has to adopt a customer-centric vision and penetrate this throughout the organisation, and this is exactly where we see our expertise to come in first. The past has shown that all other attempts are short-lived, ineffective, costly and likely to introduce even more stress and turbulence – at a time when that’s the very last thing you need. The cards are on the table; the choice is yours. After all making it work isn’t magic – just common-sense. No matter how committed management is, you ain’t going nowhere without a proper information gathering, storage, retrieval and analysis system. Often there is customer information abound; it’s just hidden in the accounting system or other legacy databases, and therefore inaccessible to the modern marketer. Your sales force may have its own contact management system, and your marketing department may be in possession of a direct mail database, too. It’s there, but it’s uncoordinated, non-integrated, often “dirty”, and thus of limited or no benefit. Nowhere in marketing becomes the holistic nature of the “Diamond” more apparent than in the information system structure and the way it is applied in daily practice. The database system needs to consist of (or link) personal, transaction, promotion, contact and lifestyle information, therefore already tying in more departments than just marketing. Furthermore, you would want to link it to your manufacturing and/or logistics system, allowing for … total customer management. Various business intelligence tools are available for larger environments, and although they were initially outside the realm of Database Marketing, vendors are currently spending more effort and time on integrating these tools, too. Fairly recently, terms like SCM (supply chain management) and ERP (enterprise resource planning) have cropped up, once again accompanied by a myriad of software tools, all promising “to be the one”. As you can imagine, none of those issues can be dealt with in isolation, and none will give you what you expect if you don’t integrate them with the others. This task is becoming increasingly complex and costly, so you should ask yourself whether what you get out of it at the end of the day will be worth the resources you commit to it in order to make it work (technically). It goes without saying that the modern marketer needs to know more about the technology side, as very little if any specific ‘one-to-one marketing’ assistance is available from database technicians and system administrators – even BI sales people. The other part of the equation is to gather data from various sources, including the emerging Instant Messaging medium. Although the Internet has made it possible for many organisations to ask for individual customer information without an increase in cost-per-contact, its potential is still largely lying dormant and very few marketing strategies are designed with individual’s real rather than perceived needs in mind. Outside the Internet there are many ways of generating valuable information. In a business-to-business environment, the contact between sales personnel and clients is still the No. 1 source of information – yet even that isn’t exploited to the fullest. In an end-user environment, info kiosks, direct mail, fax and voice messaging systems, customer help desks, instant messaging, the Web, Email, and soon interactive TV can be used to gather individual information but also to satisfy individual needs. In CRM theory you will find many ‘ideals’ that sound easy but are complex in execution. However, the tools exist today – so does the knowledge to use them – and there is no longer an excuse to avoid this subject. In fact, not using a database-driven marketing system will soon endanger your organisation as much as not using the Internet or Internet technology. And while you may not be able to set up the ideal system right first time, starting small and less complex – as long as it’s integrated – is definitely preferred over waiting forever. Remember though that there’s no use of having a system if those who are populating it and those who are analysing and applying their knowledge aren’t empowered, trained and motivated. So if you need assistance on this level too, we are there to help you. In a small business, the ‘Systems’ element represents the contact management software and the accounting system. Under the traditional system, a link between the two would be unthinkable. Under the new system it is becoming indispensable. Unfortunately, this link is only rudimentary and not an integral part of the system – too many discrepancies exist. In fact, your only choice these days is a plain ASCII import and export. This shows once more how far behind mainstream thinking and software development are. You already see at this stage the technical requirements for this new approach. You can virtually take any off-the-shelf contact manager to start with. We don’t want to make any recommendations, but if you would like to know, we can tell you about our experiences with some of them. We suggest you start this way, as it will teach you the discipline necessary for later data analyses, because if you don’t enter data in the first place, how do you expect to analyse and benefit from it? Also remember that even if you have hundreds or thousands of customers, you will more than likely start with very few numbers – usually your best (high net value) customers. In larger operations, “Systems” represents an integrated relational marketing database management system (RMDBMS for those who like acronyms) – one one that links personal, contact, transaction, lifestyle and promotional information. It also represents physical (external) contact points such as info kiosks and the Internet -just to name two- , all of them linked to and with the central Customer Information System (CIS). Same as in small businesses, there is no off-the-shelf product current available, so you will need to set up a tailor-made system with one of the many OLTP (online transaction processing) and OLAP (online analytical processing) and products available, or use one of the emerging CRM suites. Remember though, that they are usually very expensive and more often than not do not work the way you do. Very few -to this day- integrate campaign management or business intelligence. Fortunately, this is slowly changing. Obviously, due to the complexity and sheer size of a large business, one has to take a number of other variables into consideration. It no longer suffices to only have transactional data for analysis purposes, but the entire customer history. This calls for facilities and processes to allow the customer to update his/her data any time s/he likes. This may happen in form of info kiosks, but could also more and more take place on the Internet itself, and these days via mobile devices, too. This will also reduce the work of the IT department to have clean data on the system. On the side, we are aware that this is not applicable to all business environments, but the advances of technology will make this step viable for more and more organisations. This updating process also includes direct contact (feedback, comments, complaints) with the organisation; needless to say that this data has to be present on the system, and needs to be evaluated before any marketing or promotional action should be taken. In the same vein, help desk software is also an integral part of the system, where anyone at any time -given the security procedures exist – can retrieve the customer’s history on the screen. Our role here is to advise you of the possibilities and opportunities that exist, find and evaluate software solutions, and flank and support you while the system is being set up, tested and rolled out. We see ourselves as the crucial link between the software house or programmers and the end-user, as the intermediary that is necessary that everyone understands each other’s language, needs and capabilities. At entry level, this represents basic inter-personal communication skills to develop a friendly atmosphere between floor staff and the customer. Training courses or even individual tuition can be conducted to facilitate this; however, one must always take the entire “situation” of the staff into account, as they may, for instance, be reluctant to learn, adopt or follow because of other non-addressed grievances. Here, again, you can see how important an holistic approach is. In a more advanced organisation, this will culminate in Relationship Managers overseeing and analysing a portfolio of customers, and communicating with them on an ongoing basis. This links marketing and computer skills, but also includes cross-cultural knowledge for enhanced marketing decision-making. If you have an organisation that has millions of customers, you may ask: “But how can I do this? This would mean having hundreds of Relationship Managers!“. This is not correct, as one of your first steps is to identify your most valuable customers; not only in terms of turnover, but also those who have been in contact with your organisation before – just not in a transaction process, and those who could become customers in the future, like family members and friends of your customers or clients. It becomes paramount that the Relationship Manager has sufficient authorisation (read: is empowered) to initiate actions or remedies for customers at his/her disposal. But it is not only the setup and training of Relationship Managers that we need to look at. It’s everyone in the organisation – from the receptionist to the chief executive. With all due respect, we are not creating super-humans here, and expect them to do miraculous things. We merely ‘tune’ them to this new methodology, and make them use the tools we have given them – and that they helped us to design in the first place. Personal, social, cultural, spiritual and technical skills also need to be taken of, because they provide the foundation for getting the job done. No foundation, no relationship-building. This element combines the offerings of the organisation in terms of products and services. It also includes the ability to solve non-product-related customer requests, which play an important role in the day-to-day communication between the organisation and the customer/supplier. You can already see here that the service extends beyond the obvious, and includes everything a customer or prospect may want to know. At the basis of Service, however, needs to be a quality product – without it, the model would collapse. But by virtue of this integrated system, the organisation is likely to have this quality product anyway, as both internal and external communication channels contribute to improving the product on an ongoing basis. Built-in change par excellence! ‘Service’ is about the application of information. In the previous stages or sections we have defined and set up a system that holds information as well as trained and empowered staff to use the tools; now is the time to apply them pro-actively, and not only in a strictly product-related context. Example: A large life insurance company in South Africa has a system that calculates insurance requirements on the fly. The agent enters all relevant data, and the system finds out where you’re covered well and where you fall short. This is a marvellous thing to have and use, as it simplifies and speeds up the process significantly. What is missing however, is a facility to enter specific lifestyle information and search/analyse it as with all the other tools. Say, the agent comes across an interesting snippet about ‘sailing’ which he’d like to share with those of his customers who are interested in sailing. He should now be able to query the lifestyle database and extract all the relevant names. They should come up in a list and give the agent the option to either phone, fax or email them. This in itself is completely sales-unrelated, but it is an important step in the relationship-building process, and I need not tell you the effects it can have on sales, too. The agent can now use his skills by using the tools given to him to strengthen the bond between him/the company and the customer, and by this adding one more piece to the process of keeping customers satisfied and loyal. It is important to understand that in a customer-centric business environment, non-product related services are of equal importance, because if you want to build and benefit from a long-term customer relationship, don’t fool yourself in thinking that it’s all about shoving more sales information down the customer’s throat. In many instances, the personal side will actually outweigh the sales or transaction side, which is just a very profitable side-effect of a functioning relationship between the Relationship Manager and the customer. Up to here we have discussed the importance of management support, an integrated database marketing system, and an internal skills base that is motivated and empowered to populate the database, and skilled to analyse and exploit the potential of this knowledge base. However, if you pursue a customer-driven and database-supported approach to marketing, you will have to rethink the way your business is structured. Business unit separation according to geographic location and products will no longer suffice. Whereas this subject can be neglected in smaller companies with a flat structure, larger, more complex organisations have to make sure their structure supports a marketing approach that is centered around customers and not products or geographic areas. As far as customer management goes, Peppers/Rogers maintain that ‘the 1:1 enterprise will need to have someone who can be held accountable for the entire enterprise’s relationship with each individual customer.’ You’ll also need to establish to whom this Relationship or Customer Manager is reporting – IT or Marketing or, in fact, a Director for Customer Management. In the same breath, remuneration and commission structures have to be reviewed if you don’t want to risk your long-term relationship-building approach being made null and void by short-term oriented reward systems. Having identified your most valued customers, you can group them into portfolios based on similar needs. The managers in charge should be given line responsibility for all the communications and dialogue interactions with the customers in their own portfolios. This clearly marks the final departure from traditional brand and communications management. How you restructure your organisation in detail is up to each individual situation – a blueprint simply does not exist, nor would we go into more detail on this website. Serving customers on an individual level being the essence of the “Diamond”, the next logical step would consist of deciding how to tailor the organisation’s production, distribution and service delivery systems to satisfy these individual needs. Peppers/Rogers suggest this function to be handled by ‘capability managers’ as a natural extension of product managers. In order to perform her job, the ‘capability manager’ needs to access the entire history of the firm’s high-value customers. Obviously, this is impossible without already having set up an integrated system and redefined the communication process to gather detailed customer information in the first place. With the rise of the Intranet and dropping hardware prices, communication, control and support structures can be set up at very little cost compared to the potential benefit one derives. You see that this element is not as ‘tangible’ as the previous ones, but rather ties in the different relationship management-based activities and coordinates them to maximise effectiveness and efficiency. Role responsibilities of various departments are about to change, and this has to be taken into consideration when it comes to accountability of their actions. If you’d like to further your knowledge on this subject, the above mentioned book as well as ‘Customer Driven Marketing’ by John Fraser-Robinson, and ‘Corporate Lifecycles’ by Ichak Adizes make excellent and easy reading. At the root you will find the element that represents a mutually beneficial transaction; one that is profitable for the organisation but still priced at a level acceptable to the customer. The sale is what allows the organisation to stay in business, and despite the more personal, friendly and service-oriented atmosphere, it’s the sale that counts. What has changed, however, is that it’s the service that develops into a sale and not the preoccupation with moving as much product as possible, regardless of customer needs and characteristics. The last sale is usually the bridge or intro to the next sale. In the interim, the Relationship Manager has ample opportunities to reinforce the bridge by using the tools at his/her disposal. And as we have seen earlier on, even simple things totally sales-unrelated can play a significant role in the run-up to the next transaction. The “Sales” element is also the place where most of the hard data for analysing business performance originates from, providing you with many indicators in terms of where things go wrong or run smoothly. Ultimately, a transformation based on the “Diamond” impacts substantially on the bottom line: it means more sales, more certainty, a better climate between customer and company, a more predictable and profitable future for the organisation as well as less hassle and more satisfaction for the customer. 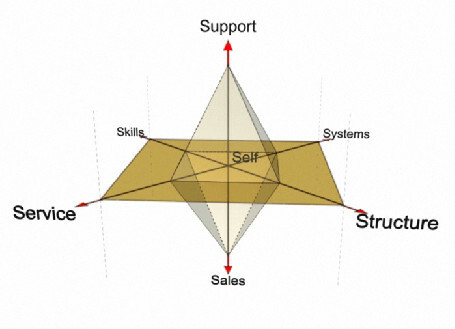 The Diamond CRM Business Transformation Framework is useless if it doesn’t benefit the customer, and this makes it clear one very last time that the center of gravity for any organisation is the satisfaction of customer needs. The sale, even at a higher than perceived price, is the ultimate benchmark of a successful relationship between the customer and company, and only those who master the skills of relationship management by using the tools that exist will prosper in the future. Obviously there is much more to it, but this should just serve as an introduction and show that the foundation on which we base our model is sound and proven. Now the good news is that all this won’t cost you the earths, so for an indication of costs, have a look at my fee structure. And at the core of everthing is you. At the very core of the Diamond CRM Business Transformation Model stands the individual, who is making it or breaking it. Businesses are just people working together, and their healthy attitude towards life and serving customers is what ultimately shapes and determines the organisation’s overall success.